Baby Edna and her fos­ter mother are a sweet reminder of ore motto, HAND IN HAND WITH THE LEAST OF THESE. Thank you to all who sup­port these pre­cious lit­tle ones. REALITY ON THE MISSION FIELD, A FAITH BUILDING WEEK. To have an effec­tive min­istry on any mis­sion field, means a mis­sion­ary is always open to mul­ti­ple attacks from many avenues. This week, we had more than our share. 1. Sadly, over last week­end, Stephen Miller, decided that Balama was not for him and requested to go home. While I was in Maputo last week, he strug­gled to han­dle the stress of the lone­li­ness and iso­la­tion of a city man in a totally iso­lated coun­try set­ting. Stephen was a great help while he was here as he truly loves the Lord. My prayer for him is that he finds a place in the USA where he can faith­fully serve the Lord. Balama’s lack of social life and enter­tain­ment is hard on every­one who comes here. Some just can­not live in such a quiet, iso­lated area, where we have to make our own entertainment. I have had mis­sion­ar­ies from cities within Mozam­bique who have ques­tioned how I han­dle the isolation. First, you have to be truly called of God, cou­pled with a “spirit deep commitment/never say QUIT atti­tude”, towards both GOD and the peo­ple He sent you to serve, or you will never make it. Sec­ond, You have to be a “self-starter”, well-motivated, full of per­sis­tence, per­se­ver­ance, and the desire to serve the Lord no mat­ter what is thrown at you. I had no idea as I waved good­bye to Stephen on Mon­day morn­ing, that the busy week­end was just a warm-up for what was about to hit. 2. MONDAY: First acci­dent at our play­ground. A neigh­bor­hood boy, age 7, fell and broke both bones in his left fore­arm while get­ting out of the sand pit at the foot of the pre-school slide. I was at the goat pen, 3 miles away in Rovuma vil­lage when it hap­pened. We had 3 men super­vis­ing the chil­dren, as it hap­pened at after­noon activ­ity time. His fore­arm was at a 90 degree angle, so a seri­ous break. They called me from the hos­pi­tal, so I dropped all and headed to the emer­gency room in Balama. All ended well, as the hos­pi­tal staff did a great job of putting the arm straight, and then cast­ing it. Smarted a bit, as no anes­thetic is avail­able at our hos­pi­tal, but this young man was super brave and only shed a few yells and tears. I then took him home, which was “fun”, since this lit­tle one only knew the route “he walked” to get to our play­ground. We lit­er­ally had to take him to our com­pound and then retrace his route to get him home. Sort of like wind­ing through a rat’s maze, as we snaked our way between mud huts on nar­row roads. His mother is one of the local school teach­ers, and was shocked but most grate­ful for the care we had given her son. I saw him yes­ter­day run­ning down the road, so it is obvi­ous no bro­ken bones will keep that lit­tle man from hav­ing a good time! 3. TUESDAY: Our corn grind­ing mill broke down after milling only 4 sacks of corn (still had 14 to go). The axle in the mill finally wore out after 4 years of use and was mak­ing a hor­ri­ble racket. Fast action was needed, since we still had about 840kg (1,848 lbs) of corn to mill that was to be dis­trib­uted at Thursday’s food give out. Capena, our office man­ager, was out on an errand, and Manuel, our mechanic and dri­ver, had just left for our Meluco orphan­age, 6 hours away. I called Capena, who raced back to fetch the corn, tak­ing it to a local mill he hoped would help us out. Not all mills will take that much corn at one time, since it means they can­not attend their reg­u­lar cus­tomers. It takes about 5 hours to mill this much, but God gave us FAVOR, and it was done by late that after­noon. PRAISE THE LORD! 4. WEDNESDAY: All was going well until Manuel didn’t return from Meluco by Noon. Mul­ti­ple tries to reach him by phone didn’t work. I was ready to go look­ing for him when he called in. The TRANSMISSION had gone out on the Land Cruiser he was dri­ving in a zone where no cell ser­vice existed. This is the same pick-up he just drove on the 12 day jour­ney to Maputo and back. He man­aged to find some­one to tow him to Mon­tepuez, the town 30 miles (60 kms) from Balama. Our mechanic there told him to tow the truck back to Balama, for it would take sev­eral months to find a new trans­mis­sion, and he refused to guard the truck that long. THANKFULLY, Capena was at the Mont­puez bank deposit­ing funds to pay for the water well parts that we bought last week. Capena was dri­ving my Land Cruiser, and after buy­ing a strong tow rope, was able to tow him to Balama. Not as easy as you think since a HUGE RAIN STORM com­plete with heavy light­en­ing, flooded Balama’s streets as Capena and Manuel entered the last 12 miles (20km) of their drive. They finally made it home just before dark. Eric Dry is try­ing to help us orga­nize a rebuilt trans­mis­sion for the truck. Not an easy task due to the dis­tance to find parts which are only found in Maputo, 4 days drive away, or South Africa, 5 days drive. Other chal­lenges are the cost, and the dif­fi­culty of import/export, and trans­port to get such a heavy piece of equip­ment up here. So the truck will be sit­ting for a while, as we work out a solution. NOTE: When my old King Cab’s trans­mis­sion went out 5 years ago, it sat for 8 months, as we tried to get the parts up here for the repairs. NOTHING IS EASY IN THIS PART OF AFRICA. That is why “per­sis­tence and per­se­ver­ance” are nec­es­sary traits if you plan to sur­vive the daily chal­lenges of being in mis­sions here. 5. THURSDAY: Repair­ing the old corn grind­ing mill was not pos­si­ble as it was totally worn out, so Manuel found us a new one. He plans to have it run­ning by Mon­day afternoon. We were blessed to get 4 years from that mill, as we mill about 1.5 TONS of corn/week to feed the 318 orphans and wid­ows whom we serve at each Thursday’s food give out. This group includes the 25 homes of orphans liv­ing in our spe­cial homes near our mis­sion sta­tion, plus 211 orphans liv­ing with elderly grand­moth­ers who can no longer farm, and are totally depen­dent on our help to pro­vide for their orphaned grandchildren. FACT: It is usu­ally only the grand­moth­ers who will take in orphaned fam­ily mem­bers. I take my hat off to these women who have tons of love and a big heart for children. 6. FRIDAY: I was sup­posed to go to Pemba to get sup­plies, but I was rudely awak­ened at Mid­night with all the symp­toms of malaria. Seems I brought back more from my Maputo trip than I planned on, since the incu­ba­tion period for malaria was just right. Not the way I planned it, but there was no way I was going anywhere. I’m totally fine 48 hours later as I con­tinue the 3 day pack of med­ica­tions that kills it out, as I never delay start­ing treat­ment. Delay­ing is what causes this hor­ri­ble mos­quito car­ried dis­ease that presents with “flu type symp­toms topped off with a migraine headache” to pro­long it’s course and cause per­ma­nent organ damage. These chal­lenges, hit­ting one after the other, seemed over­whelm­ing to me ear­lier this week, so I hit my knees. JESUS sent HIS PEACE and ASSURANCE that He will pro­vided all the solu­tions for our chal­lenges. In years past, I’ve wit­nessed HIS SOLUTIONS come forth to over­come greater chal­lenges than this. That is why I call this a FAITH BUILDING WEEK. Bless­ings and much THANKS to all of you, who faith­fully pray for us through our daily challenges. MAPUTO TRIP RAN SMOOTH AS GLASS, THANKS TO YOUR PRAYER COVERAGEThere was no doubt that the Lord’s hand was in this 4 day adventure. My Mon­day flight on LAM to Maputo went smoothly, with only a minor delay at landing. LAM (Moz. air­lines) has the nick name of “Late And Maybe”, mean­ing it usu­ally runs late and it “might” get you there. We got to within 30 min­utes of land­ing at Maputo when sud­denly the engines did a great decel­er­a­tion, feel­ing like we “stopped” in midair. Cap­tain announces that the Maputo tower had asked us to slow down because 2 other planes were already in the land­ing pat­tern and they could not han­dle us at this time! We all got a hoot out of that one! (Seems 2 is a crowd, and 3 impossible). Then we get to the airstrip 20 min­utes later, and were told to “cir­cle over the ocean” because there were still 2 planes in the hold­ing pattern. So we cir­cle and are finally able to land safely, a bit late, but we were there! All land­ings are great land­ings if you can walk away from them. FYI: LAM has great pilots who do a very good job with the lim­ited run­ways avail­able to them. The new air­port at Maputo is all glass front and very beau­ti­ful and clean. Far cry from the last time I was there. Grab­bing my lug­gage, Manuel and Car­l­i­tos were there to fetch me with our Land Cruiser pulling Eric’ Dry’s trailer. So off we “crawled” to the bor­der, only 40 miles (80 km) away. Traf­fic in Maputo is thick all day long for there are more cars than there is road space, and only 1 road to get you where you need to go. First 5.4 miles (9km) took us 40 min­utes. Once we cleared the city traf­fic, we were able to move on, get­ting to the bor­der at 7pm (this bor­der closes at 10pm). We breezed through, meet­ing Eric on the other side, where he led us to the B&B where we would sleep, reor­ga­nize sup­plies, and repack at 5a.m. the next morn­ing. Because I had pre-organized most of the lug­gage when I was in RSA in Feb., the re-packing was com­pleted by 10a.m. A quick sand­wich for lunch and off we headed to the bor­der with Manuel dri­ving the Land Cruiser, and Eric and I fol­low­ing in Eric’s SUV pulling the trailer. THAT is where we knew the fun would begin, as cus­toms can be challenging. I apol­o­gize to my RSA friends, as there was no time for phone calls. We were only in RSA for 16 HOURS! God threw open the doors, and we breezed through with­out a problem!!!! We were on the Moz. side, dri­ving to Maputo by 11:15a.m.! A SUPER MIRACLE THE LORD CAN REPEAT ANY DAY! Once in Maputo that Tues­day after­noon, we got to our hotel, again unpacked, and orga­nized some of the lug­gage to travel by air with me (heat sen­si­tive items), and the rest was insu­lated in suit­cases for the 4 day drive back to Balama. These sup­plies are VITAL to our mas­sive food dis­tri­b­u­tion pro­grams, as well as the health of the children. No sup­plies would have lit­er­ally shut down our exten­sive food assis­tance pro­gram to over 2,500 orphans and widows. Manuel and Car­l­i­tos arrived TODAY, March 21st, after 10 days on the road! They picked up a load of water well sup­plies on their way back from South Africa, and brought them in along with the VITAL sup­plies needed to keep our pro­gram run­ning smoothly. Won­der­ful to have our whole team back at the base! The truck arrived at NOON today, with all of us super happy to have made the trip with­out any hassles! GOD IS GREAT! ALL THE TIME! Is the job tough? YOU BET. One look at our huge fam­ily of chil­dren, and there is NO DOUBT in my mind! YES, I would do it all again anytime. Capena, my office man­ager, and Stephen Miller, mis­sion­ary trainee, han­dled the basic mis­sion pro­grams this week with­out problems. Our newest fam­ily mem­ber, Baby Edna, is now healthy (she came to us with a mild res­pi­ra­tory infection). The 80+ orphans liv­ing in our fos­ter homes are all doing well in school, and enjoy­ing the won­der­ful play­ground fur­nished by ICM, Inc. of Wichita, Kansas. I opened the slide yes­ter­day, and it was like bees flow­ing into their hive, as the chil­dren swarmed up the 2 story ladder. More next week, as we pre­pare for our first MAJOR AWANA COMPETITION on April 11th! We have invited the AWANA vil­lage teams from 4 areas to participate. The Inter­na­tional AWANA leader, Larry Friend, as well as orphan spon­sors Dave and his Daugh­ter Jill will be vis­it­ing us from April 10th to 17th. BABIES BOOMING IN BALAMA!We received 4 in one day on Thurs­day, the 12th, so to say things were “hop­ping” around here is an understatement. Three of the babies have fam­ily to care for them, but one of those babies was crit­i­cal, so I had to rush her to the emer­gency room to be admitted. Baby Edna and her grand­mother needed more than just milk and a baby bottle. Meet Baby EDNA Sal­i­hina (Sal-eh-hee-nah), born Nov. 25, 2014, who now lives per­ma­nently in our fos­ter home for girls. PTL she is healthy, weigh­ing in at 3.5Kg (7.7 lbs) as a 4 month old. Her mother died about a month ago, rea­son unde­ter­mined. Granny Ros­alina (very up in age) brought Baby Edna to us imme­di­ately to ask for milk, know­ing the lit­tle one would not sur­vive with­out it. We watched Granny Rosa really strug­gle these last 30 days, try­ing to care for Edna. Liv­ing 8.5 miles (14 km) away, she suf­fered much to carry Edna to our milk dis­tri­b­u­tion point each week, as no other fam­ily mem­ber exists to help carry the baby that long dis­tance. Granny, very thin and unhealthy her­self, knows she will not live to see the lit­tle one grow up, and asked us to take her into our care. With a few phone calls, Capena, our office man­ager, con­vinced Social ser­vices to allow us to adopt her since no other fam­ily exists. Granny will receive food every 2 weeks at our widow’s and orphan give out, since she was only eat­ing the star­va­tion root called Casava. She is very happy to get to visit Baby Edna when she fetches her food. BABY EDNA needs a spon­sor for $30/month, as she is already on Baby Food and for­mula, and eat­ing well. Left to Right: Mario, (now in dri­ving school, so he stayed behind), with Car­l­i­tos and dri­ver Manuel about to depart for Maputo with truck and trailer. MANUEL and CARLITOS drove out at dawn on Thurs­day morn­ing to begin the 5 day drive to Maputo (National Cap­i­tal of Moz.) for our once a year sup­ply run. On Mon­day, 16th, Capena and Stephen will “hold down the fort” in Balama, while I will fly to Maputo. Our truck team will fetch me at the air­port for the 1 hour drive into South Africa. Once loaded, we will return to Moz. and sleep overnight. I will fly back with the heat sen­si­tive sup­plies on the plane, and the truck will drive for 4 days to bring the rest. I will not have e-mail ser­vice from 16th to 19th, so any mes­sages will not be answered until I return to Balama next Friday. Friends of mine, Julie and Alf Saun­ders are car­ing for orphans and doing a fan­tas­tic work among the poor in the Golan Heights area of north­ern Israel. This area is just south of Syria, and is a big “hot spot” with many chal­lenges at this time. Please keep them and all those liv­ing in that area in your prayers. It is reported that there is a heavy accu­mu­la­tion of troops just 6 miles across the bor­der from there. WITH THE 3RD BLOOD MOON FOLLOWING CLOSE BEHIND ON APRIL 4TH! GOD IS SHAKING THE HEAVENLIES, SO KEEP YOUR SPIRITUAL EYES SENSITIVE TO WHAT THE LORD IS ABOUT TO DO. TOGETHER WE ARE MAKING A DIFFERENCE WORLDWIDE! PRAYER AND PRAISE ARE THE MOST POWERFUL TOOLS THAT GOD GAVE US. SO BOMB THE HEAVENLIES. FORCE DEMONS TO FLEE YOUR LIFE AND THE LIVES OF THOSE YOU PRAY FOR! Katie and Ash­lynn busy sort­ing clothes for our kids. Sat­ur­day, the Balama Blaz­ers, Katie and Ash­lynn, and I will leave Balama for the 4 hour drive to Pemba. They can catch a plane and begin their 40+ hour jour­ney to the USA. When Jesus sends you to one of the “ends of the earth” spots He talks about in the Bible, it takes a while to get out of there. Katie Pol­cyn and Ash­lynn Gra­bill went the “extra mile” by giv­ing a year of their lives to help keep our orphans pro­vided with love, as well meet­ing their phys­i­cal and emo­tional needs that are essen­tial to rais­ing up great children. Many tears have been shed by staff and chil­dren over their leav­ing, as they are dearly loved, and will be greatly missed. But the Lord has other assign­ments for them, so they must say good bye. From all of us in Balama, our Orphans Unlim­ited Board and USA Staff, we say THANK YOU MY FRIENDS for bless­ing us with your pres­ence and help­ful hearts. You were both a joy to have here, and a bless­ing in all you did to help make my load a bit lighter. You endured the hard­ships and many crowns will await you in heaven for all you gave to save lives in Mozambique. See you again in heaven, if not before. Atoomany, the mas­ter pedal power sewing expert who makes all our children’s cloth­ing, was joined by a 3 foot tree snake in his place of work. He told me he was sewing along on his pedal pow­ered Singer sewing machine, when he heard a loud PLOP, right out­side the win­dow next to him. He went out to inves­ti­gate, and that move kept him from being cor­nered by this nasty crit­ter. For this 3 foot tree snake, in a very bad mood from falling out of our kitchen’s mango tree, zipped at high speed through a small hole in his shop’s win­dow screen. (The screen had been chewed open by a rat). Plenty of work­ers were nearby, so his call for help was answered by 6 men. The snake never stood a chance. One of the men grabbed our 12 foot (4 meter) snake killing bam­boo, shoved it through the Y joint of a small tree, and snapped it off in the mid­dle. The 2 pieces were then taken by 2 men into the sewing room, ready for action. The snake was hid­ing, so some quick moves by 2 men had to be made to get the snake out of hid­ing. Once the snake was forced into the open area, the WHACK WHACK, told me that the dan­ger was over and the snake was history. Ash­lynn helped Atoomany sew a piece of screen over the hole, so pre­vent fur­ther vis­i­tors. All’s well that ends well! OFF TO PEMBA IN A FEW HOURS, so I need to close. Bless­ings and Much thanks to all of you for your prayers and faith­ful support. YOUTH EARNING FUNDS FOR CHURCH KEYBOARDThe church youth group decided they wanted to buy a sim­ple key­board for the church. Bertino, our Youth Leader, knows how to play sim­ple music learned from the Assem­bly of God music group (who have a keyboard). I’m very proud of our youth group, because they did not come run­ning to “Mama Brenda” ask­ing for money. They began by work­ing for oth­ers in their farm fields. When that work ran out they had 1/3 of the funds. Only then did they came to me ask­ing if I’d give them the con­tract to clean my Moringa fields, instead of giv­ing it to work­ers. I read­ily agreed. Last Sat­ur­day they com­pleted that con­tract but still lacked $40, to reached their goal of 8,000 Mts ($250). They begged for more work, but I only had one small area that needed clear­ing behind my garden. Kids clean­ing fields to earn funds for church keyboard. About 15 youth showed up and attacked it with glee, know­ing that when they fin­ished, funds for the piano would be complete. BUT THE MET A FEW SURPRISES! Two ADDERS (poor cousin to the Rat­tlesnake for they have the same venom but no warn­ing rat­tler), let them know real quick that this was THEIR AREA and the kids were to get out! There were 3 adult men with the chil­dren, so these 2 slow mov­ing, but deadly snakes lost the bat­tle, as the men beat them to death with long bam­boo rods. Need­less to say, I sent the kids home with­out fin­ish­ing the field, as it was just too dangerous. I told them I’d give them what I promised as “dan­ger pay” for almost com­plet­ing the field. Sev­eral men will com­plete the field with much cau­tion later this week. I appre­ci­ate the snakes for con­trol­ling the rats in my field, as these 2 super fat snakes had eaten well, but they must learn how to be good neigh­bors if they want to live near my garden. Bertino will take a taxi this week to Nam­pula, 7 hours south of Balama, to make the pur­chase. Excite­ment is in the air, as the kids wait for their long desired key­board. It’s great to see them grow­ing up, and being will­ing to work for what they want. Our “life skills” lessons are work­ing, and this is the fruit. Pas­tor Alberto set up a 5 week train­ing course for our pas­tors and lay lead­ers, which started Feb. 27th. Pas­tor Alberto teach­ing our devo­tions class with SANDWRITING. In the photo, he is teach­ing our entire staff and work­ers about God in 3 per­sons with a dia­gram drawn in the sand. In the class­room we have a real white board, but when in Africa, do it the African way! The sand is reg­u­larly used daily for busi­ness nego­ti­a­tions for adding up a sale, count­ing items being loaded onto a truck, as well as kids draw­ings and games. Costs noth­ing, and eas­ily erasable by drag­ging a foot across it. When in Africa, we do it the African way. DAWN HORGER, MICHIGAN, WILL JOIN OUR MISSIONARY STAFF IN APRIL! Dawn has a long his­tory of mis­sions, and has been work­ing in Beira, Mozam­bique as a Pro­gram Direc­tor. Those mis­sion­ar­ies had to leave for health rea­sons, so Dawn has applied to join our staff. She will arrive from the USA on April 8th. Need­less to say, I’m very pleased that we will con­tinue with a 3 mis­sion­ary staff here in Balama. We will really miss you, Katie and Ashlynn! Really hard to see them go, as they have been my right and left hands for the last 10 months. The kids are heart­bro­ken, and the staff like­wise, but it’s time for these 2 won­der­ful young ladies to return and begin their next assign­ment for the Lord. We pray for all of you, and appre­ci­ate your prayers for our har­vest. God is mov­ing, for the corn near our church in ROVUMA VILLAGE, has sud­denly SHOT TO THE HEAVENS in growth! Reports tell me the same is hap­pen­ing in other areas where we have churches. I’ll get you a photo for next week’s blog, as some fields have grown from 5 .5 ft. to 8 feet in the last 10 days! WE ARE CALLING IT HEAVENLY CORN, for it sur­passes any­thing I’ve ever seen! HOWDY FOLKS! BUNNY BACK FROM SOUTH AFRICASorry I missed mak­ing a blog last Sat­ur­day, but Eric and I didn’t fin­ish orga­niz­ing my new lap­top until after church on Sun­day. I flew back on Mon­day and all went well. Eric, my friend/hostess Elz­abe, and I orga­nized all the sup­plies, did the shop­ping, and even had some time for frozen yoghurt and ice cream on sev­eral of the days. Eric and I had sup­per with my friend Mike Lan­der from Pray 4 Zion, as I part­ner with mis­sion­ar­ies Alf and Julie Saun­ders by send­ing part of my tithes and offer­ings to sup­port orphans in the north Israel. Capena, office man­ager, Katie, Ash­lynn and Steve were busy milling the corn on Mon­day and dis­trib­ut­ing food to the orphans on Thurs­day. Our car­pen­ters man­aged to get the required bunk bed lad­ders and safety bars built. Nel­son, our first orphan to enter into 11th grade, is now busy paint­ing these lad­ders for us and going to night school. Ever see 39, ten pound grasshoppers? That is what we now have with the 39 baby goats that were all born within 2 weeks of each other. I went out to give them their 30 day de-wormer treat­ments this a.m. When we turned them out with their moth­ers to graze, all I saw were goats hop­ping in every direc­tion. They don’t like the damp, foot tall grass (30cm), so try to hop over it, only to find them­selves in deeper grass. There is no keep­ing them with their moth­ers, who graze nearby, as these lit­tle ones much pre­fer to stay and play on the 3 logs we have in the shade of our cashew nut trees. Baby goats only drink milk until they are at least 30 days old. That is when their stom­achs are ready for green leaves. So these lit­tle stinkers are only inter­ested in play­ing around, and have no use for their Mom­mas until their stom­achs start growling. Since all chil­dren in this area (orphans or not), only speak their tribal lan­guage, Makua, our pre-school helps pre­pare them for first grade. If you do not know Por­tuguese, then you will fail, as the teach­ers are required to teach only in that language. All 4 and 5 year olds in our 25 orphan houses, as well as the young ones who attend our Sun­day school or just live In the area, are eli­gi­ble to enroll. Main objec­tive is to teach them the Bible and Por­tuguese, through song, pic­tures, and games. They also learn the alpha­bet, col­ors, and their num­bers, so are well ahead of most 1st graders when they enter school. The new play­ground is a big hit, but these lit­tle ones are for­bid­den to climb into the tree­house slide, for they are too young to han­dle it. Please pray for the corn and bean har­vest in our area, as late rains are caus­ing the har­vest to be late, and pos­si­bly smaller than usual. This means real prob­lems for our food dis­tri­b­u­tion to the 2,500 orphans who depend on our program. With God’s help there is still time for the corn and beans to multiply. They just need some sun shine and a boost from heaven. FULL TIME FEMALE MISSIONARY HELPER NEEDED WHO CAN COMMIT TO 10 MONTHS STARTING IN MAY OR JUNE. SPONSORSHIP TO COVER TRAVEL COSTS, MEDICAL, RESIDENCY, AND LIVING EXPENSES PROVIDED. ONLY NEED PERSONAL SUPPORT OF $150/MONTH. THANKS MUCH FOR YOUR PRAYERS AND LOVE GIFTS THAT HELP US MOVE MOUNTAINS FOR JESUS! Today is day seven of Brenda’s trip to RSA. She has com­pressed her “to do” list into these few days, and is in the home stretch. Her plan is to be back in Moz on Mon­day. Lots of pack­ing and prepar­ing for the flight to Pemba, and then the drive to Balama. Please pray with us for favor with Cus­toms as she enters Mozambique. We under­stand Pemba as elec­tric­ity now and the only road that con­nects Pemba to Maputo, (north — south ) is sup­posed to be open by the end of February. Thank you so much, all of you dear friends who have sent mes­sages of com­fort and sup­port as my fam­ily and I have begun the process of griev­ing the loss of our son,Fil2. Your prayers and heart­felt words have been a real comfort. Phillip was a genius when it came to any­thing related to com­put­ers or the inter­net. When our old web­mas­ter became ter­mi­nally ill, it was Fil2 (as he was fondly known), who came to our res­cue. He designed our new web­site as you see it today, and taught Linda Fer­gu­son, my sec­re­tary and his mother, how to do blog updates. He was always ready to assist Linda with any tech­ni­cal dif­fi­culty, and was a key fig­ure in our min­istry for the last 3 years. We dearly miss Fil2, but his mem­ory lives on through the web­site he built for us, so that oth­ers can know what Jesus has called us to do in Mozambique. NO BLOG LAST 2 WEEKENDS was in respect for Fil2, as well as Phillip Sr., Linda Fer­gu­son and fam­ily, as she and her fam­ily laid Fil2 to rest with a great memo­r­ial ser­vice last Fri­day in Eagle Lake, TX. Any­time there is an inter­rup­tion of the blog for any rea­son, I will always post it on my Face­book page. If you would like to keep up with me on FACEBOOK, then please send me a friend request AFTER Feb. 13th. Thanks for under­stand­ing and please con­tinue to pray for Linda and family. Linda and I will con­tinue to put out a weekly blog to keep you updated on all that tran­spires as we bring 1000’s to Christ in 2015. BUSH BUNNY AND STAFF SURVIVED THE INSPECTION! Two days of show and tell, and the final rec­om­men­da­tions on the 3rd day fol­lowed by me dri­ving them back to Pemba. We did VERY well, as these 2 men were very favourable towards our pro­gram. They told us in the exit inter­view, to keep up the great work! They said our pro­gram is unique from all oth­ers in this State (Province), in that it truly meets the needs of the peo­ple “where they live”. They saw the “fruits” of our labors via the chil­dren, and were espe­cially impressed with our orphans who have grad­u­ated, trained in a tech­ni­cal skill at our base, and have become pro­duc­tive cit­i­zens in the com­mu­nity. Three of our orphans still work with us (2 in our car­pen­try shop, and Nel­son who con­tin­ues to study in 11th grade at night school and teach AWANA to chil­dren in the daytime). God has been so gra­cious to us! THANK YOU ALL FOR PRAYING FOR US TO HAVE FAVOR. God gave it for sure! Now we wait. These men will file their report that will go to the top level offi­cials for a deci­sion on our per­ma­nent licensing. UNIFORMS, school books, back packs, math sets, and all the lit­tle things that it takes to out­fit a stu­dent were given out on this afternoon. The kids get so excited when we dis­trib­ute school mate­ri­als. Eas­ier said than done, as each child was sized and their school uni­form cus­tom made for them. All grades wear a white shirt, with grades 1–7 wear­ing MAROON pants/skirts, and the high school (8–10) wear­ing black pants/skirts. NOTE: Thanks to your gen­eros­ity, our chil­dren are usu­ally the only ones who have a com­plete set of text­books in school. Sad, but some of these books are very hard to find, as they are not even sold in Pemba. The great hearted office man­ager, Capena, man­aged to buy the hard to find school books while on hol­i­day over Christ­mas in Nam­pula City, 7 hours drive south of us. Bunny’s lap­top is slowly dying of old age. Time for an upgrade before it crashes. Eric Dry located a new com­puter for me with the new Win­dows 8.2 (had to be ordered to get it, but it came in today). I will be back in Balama on Fri­day night, Feb. 13th. Plan to eat all the ice cream I can find! STEPHEN MILLER OF CALIFORNIA JOINS OUR STAFF! Stephen arrived last Wed. right in the mid­dle of the inspec­tion. But thanks to Katie and Ash­lynn, he is now receiv­ing Bible School, Cook­ing lessons, and a basic ori­en­ta­tion of our pro­grams, as he waits for my in-depth ori­en­ta­tion once I return from South Africa on Feb. 13th. 1. Elec­tric­ity is still out, but word is it “might” be restored in the next week. Repair­men had to resort to lift­ing those HUGE metal tow­ers with a heli­copter, (very dan­ger­ous), since no crane could get into the area due to muddy con­di­tions and con­tin­ued rains. Feb. is our most rainy month of the sea­son. Repairs of any­thing are super difficult. 3. 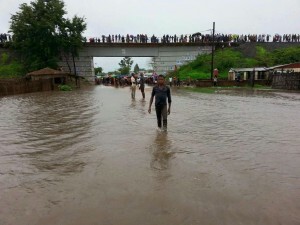 SECOND BRIDGE at Lurio River, which divides us from Nam­pula City, our biggest north­ern sup­ply post, is at full flood lev­els! Flood waters ARE AT THE SAME LEVEL OR FLOWING OVER THIS 300 YARD (METER) WIDE BRIDGE (that is a 50+ foot wall of water). 4. Heavy trucks are not being allowed to pass over the bridge at this time, as it is dam­aged. No repairs can be done at this time, but small vehi­cles are allowed to pass one at a time. TOGETHER WE ARE WORLD CHANGERS! Thank you so much for your con­tin­ued sup­port in prayer and love gifts. INSPECTORS, DESTRUCTIVE CYCLONE, AND AIR LIFTED SUPPLIES CAUSES FEB./MARCH TOUR TO BE CANCELEDI know this announce­ment causes many of you to groan, but it is just not prac­ti­cal for me to leave. Safety of the chil­dren and our mis­sion­ary staff must come first, as we are fac­ing a volatile sit­u­a­tion at the moment with many post storm challenges. A cyclone (hur­ri­cane) fol­lowed by a 2nd cyclone that down­graded to a severe trop­i­cal storm, hit our area all within the last 2 weeks. 1. The first storm knocked over 10 metal tow­ers that carry elec­tric­ity to all of north­ern Moz. Over 9 mil­lion peo­ple have been with­out elec­tric­ity and many with­out run­ning water since Jan. 12th. Esti­mated time of repair is first week of Feb., IF the rains hold off. (could be longer as Feb is our great­est rain fall month). 2. 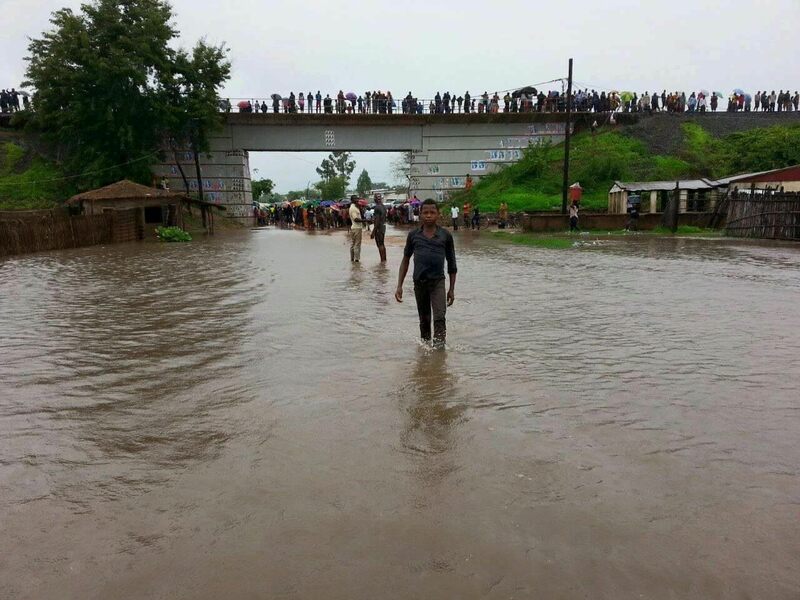 Sec­ondly, these storms com­pletely destroyed 2 major bridges on the ONLY ROAD between south­ern and north­ern Moz. This means NO SUPPLIES can reach us except by ship or air. No esti­ma­tion on when this road will open, which pro­vides vital food sup­plies for these same 9 mil­lion peo­ple. I’ve man­aged to buy 6 weeks of salt, canned fish, soap, sugar, and cook­ing oil from a Balama busi­ness­man this week. Our kids are pretty much “safe” as long as they fix this road in the next 30 days. Foods we depend on from other areas have sky­rock­eted in price, and frozen or cold foods are non-existent. Nam­pula, the largest sup­ply cen­ter in the north, has already sold out of most of its supplies. Pray for PEACE TO REIGN, (no food riots), and for the road and elec­tric crews to work with GOD’S DEVINE FORCE, allow­ing them to restore ser­vices in the next 30 days. Our kids are thrilled with the new playground. 3. We are expect­ing an air ship­ment via MAF of vital life-saving sup­plies for our orphans (com­ing in from RSA in between Feb. 15th and 28th). This was delayed from last Nov. , and I have to be here to receive it. 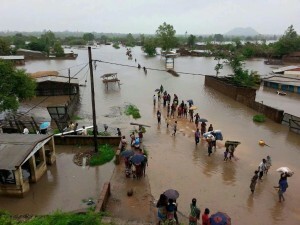 The floods caused by the cyclone destroyed many acres of beans and corn in parts of Balama as well as 1000’s of acres in the area just south of us. That means that many ille­gal buy­ers will swarm the Balama area by April 1st, look­ing for beans and corn to buy. We had favor last year with the gov­ern­ment, who allowed us to buy early, and we expect to receive that same favor this year. 5. IF THAT WASN’T ENOUGH CHALLENGES, PEMBA SOCIAL SERVICES IS COMING FOR OUR PERMANENT LICENSING EVALUATION IN NEXT 14 DAYS! Our Awana leader arriv­ing on his bike. Nei­ther rain, nor storm will keep this devoted man of God from his appointed task. This is the FINAL, and most impor­tant of all the inspec­tions so far. We are ready, but it does mean we will have to fetch them in Pemba (8 hour drive round trip), host them for 2 days, then return them to Pemba. Going the extra mile is essen­tial if you want to raise orphans in any African country. Keep your prayers com­ing! We sure need them. Thou­sands are dis­placed by the flooding. On Tues­day, I went to Pemba on busi­ness, and real­ized as we drove into town, there was no elec­tric­ity. Never a good sign! I knew south­ern Mozam­bique was being hit by heavy rains (as we had received heavy storms for the last 4 days), with some cen­tral and south­ern areas of the coun­try flood­ing with major hous­ing losses. 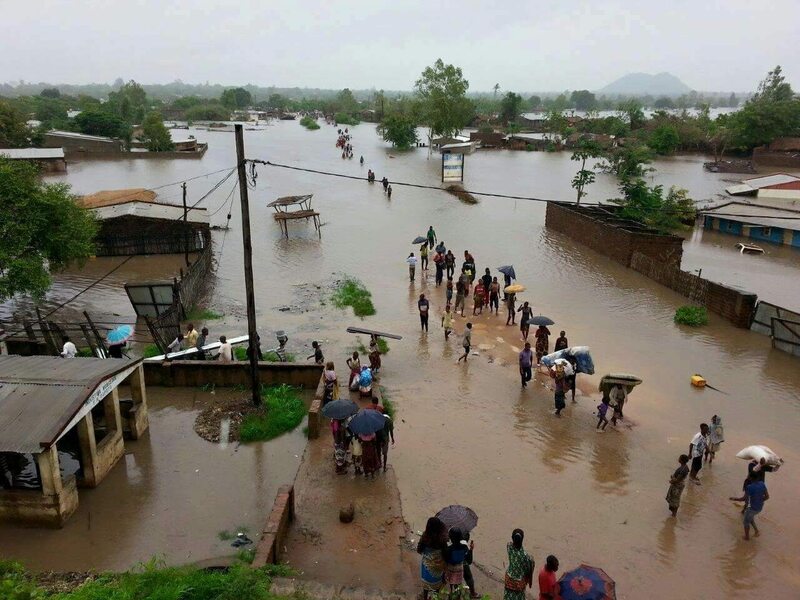 The flood­ing in the cen­tral part of the coun­try top­pled 10 ELECTRIC PILONS, destroy­ing all power to the entire north­ern part of Mozambique. It has been 5 days now, and a 2nd cyclone is about to hit that same area in the next few days. Repairs will be impos­si­ble until flood waters recede. High water has caused major wash outs at the entrance to one bridge and dam­age to another bridge. No elec­tric­ity in gov­ern­ment offices, means no ser­vice to the pub­lic. Did get the bank­ing done, PTL, cause they have a gen­er­a­tor back up! But that was all we got done. Cold food in the gro­cery stores was defrost­ing fast. I grabbed 2 frozen chick­ens, a block of but­ter, and some cheese, know­ing there would be no more “safe cold foods” to eat until power was restored. Since we are remote, and have NEVER depended on local util­i­ties, we are set up for sur­vival with­out electricity. Solar fridges, pow­ered by 6 solar pan­els and 4 large trac­tor bat­ter­ies, keep food fresh for sev­eral days to a month, depend­ing on what it is. We cook on a gas stove from bot­tled gas, and I keep a 4 month sup­ply of gas bot­tles for just such emer­gen­cies as this. Our water comes from a hand pumped water well, sim­i­lar to the ones you see on old west­erns. Noth­ing but mus­cle power needed there! BEING PREPARED AND HAVING ADEQUATE FOOD AND FUEL SUPPLIES ON HAND are essen­tial to sur­vival in remote Africa. I was once cut off for 7 weeks from civ­i­liza­tion by 12 miles of washed out road and 5 fallen bridges. Didn’t suf­fer a bit, since I had 3 months of food sup­plies tucked away. God expects all of us to BE PREPARED for the unexpected. Whether it comes in the form of a spir­i­tual bat­tle and/or a phys­i­cal disaster. KNOWING GOD’S WORD, and USING IT in the proper way, will always be the #1 TOOL I have in my heart. Are you pre­pared for what might be about to hap­pen in this YEAR OF MANY CHANGES? GET READY, FOR GOD’S SON IS COMING SOON! Might seem like a minor thing after what you just read about the cyclones. How­ever, our children’s meat source is very impor­tant, as it is the only fresh meat avail­able in this area. With out­siders com­ing into Balama, and offer­ing high prices for any edi­ble ani­mal on 4 feet, it puts our goats at high risk to thieves. Goat sup­plies are almost non-existent as most of the local grow­ers have been forced to sell off their herds or have them stolen in the night. We keep 3 strong men with machetes and pow­er­ful flash­lights at our goat pens each night, and have 3 men watch­ing the herds graze dur­ing the day. Oth­er­wise, your goats will dis­ap­pear. The thieves have even been so bold as to approach my herds­men and try to BUY the goats direct from them in our own pastures!